Bruce Marine is in the business of finding things he loves, and then letting them go. He still misses the hand-carved, wooden ship that sat on his shelf for the briefest of time. It had six sterling-silver cocktail picks with enameled flags representing different countries, and a silver smoke stack in the center that held a set of dice. He’d never seen anything like it. If he let himself, Bruce would spend all day admiring his finds. His interest began as an amateur collector, picking up pieces he loved at flea markets—always aiming to buy better merchandise and reinvest. 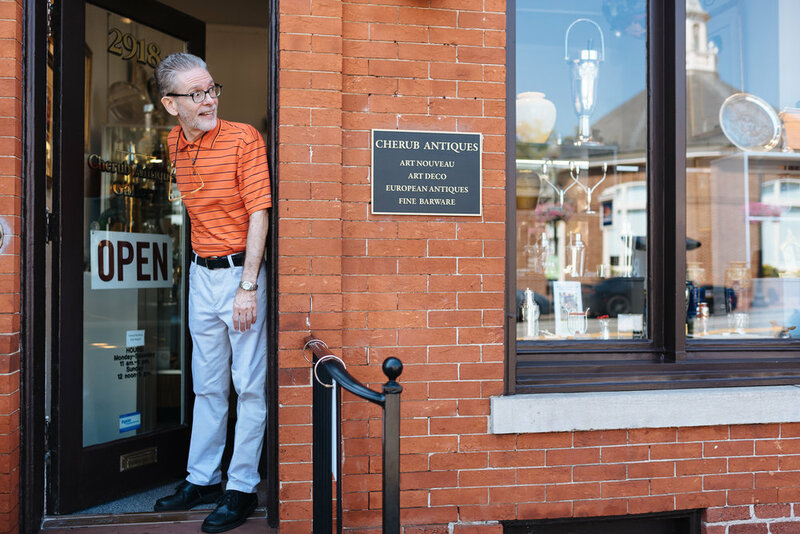 When he found himself doing antique shows, Bruce opened a store in Old Town Alexandria. Today, Bruce is down the street, still doing what he loves. He specializes in nouveau and art deco pieces, including an impressive and varied collection of cocktail shakers and bar ware. Technically, the art deco pieces of the 1920s and 1930s aren’t quite antiques. It takes a century to earn that title. But they’re close enough, and influenced everything else in that era, Bruce says—from the fashion to the flappers, the architecture, and the dishes people ate off of. Most of Bruce’s antiques hail from Europe, where he travels bi-annually to scout for new (old) inventory. In between trips, he has pickers throughout the world who are trained by his quality and condition standards—always staying away from replacement parts and damaged glass, in particular. Bruce says he enjoys the trips, but the process has changed since the advent of the Internet. For all its challenges, technology has also boosted Bruce’s business—a website, in particular, helping him tremendously with repeat customers, near and far. Many of Bruce’s regulars are corporate CEOs and politicians—people he says deal with a unique set of stresses every day and turn to antiques to take their mind off of work. One of his favorites is a former governor with a well-known collection of figural cocktail shakers from the Prohibition era. Antiques are, by definition, old. And yet, Bruce also welcomes his fair share of young customers—many of whom make it clear they can’t afford anything in the store but are still interested in antiques. Bruce would occasionally like to buy something, too, but for the most part, he says he’s satisfied acting as the brief caretaker for an item before finding it a permanent home. He still feels that way after more than three decades in Georgetown, the owner of the oldest neighborhood shop of its kind. In 66 years, Bruce can finally call himself a Georgetown antique.